The first annual CinéStudent Film Festival closed its curtain on Saturday night. We highlighted 11 student films, giving out over $200 in awards. One of the awards was an "Audience Award," voted on by the audience in attendance. As I mentioned last week, I decided to try VoxVote for the audience voting at the festival. After setting everything up, I felt pretty confident it was going to work. I didn't even have a back-up plan, which is unusual for me. I always try to figure out ways in which things can go wrong and, in this case, I either felt confident or simply ran out of time to come up with an alternative. When the audience was ready to vote, I decided to start off with a basic polling question just to get the audience ready and logged on. 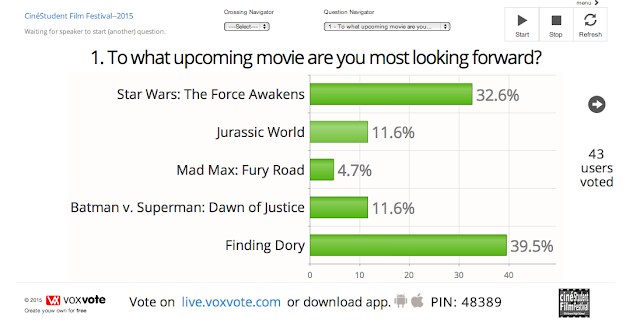 After displaying the website and pin for VoxVote, I took them to the first question. The presentation was being fed through Power Point, so I had to "command+tab" to a web browser on the Mac which was already set to go with the my VoxVote account. I showed them the first question: "To what upcoming movie are you most looking forward?" The audience then voted. I refreshed the screen periodically so the audience could see how it worked and get a near real-time tally. And, surprisingly, Finding Dory won. Then it was time to vote on the best film for the audience award. I hit the next button and told the audience to start voting and that voting would only be open for 5 minutes. But there was one small problem: I had forgotten to hit the "start" button and people started pointing out that they could not vote. Once that was figured out, the voting started in earnest. For this segment of the voting, I chose not to display the tally* and just "command+tabbed" back into Power Point. I then went upstairs and logged onto a computer to watch the results. After five minutes, I saw who had won and quickly printed out a certificate for the winner. Overall, VoxVote worked extremely well and I am thinking about ways to use it now in class. I'm even going to use it to collect votes for Film Club elections for officers, film screening choices and for film ratings. 1. Practice. Once you set everything up, go into preview mode. Run it off you computer and then try out several devices as if you are a participant. 2. Since VoxVote is web based, it can be used on any device. 3. Data can be collected, archived and sorted. You can even email voting summaries to participants. 4. It would be nice to embed the VoxVote website directly in Power Point, but our versions for the Mac do not allow this. Give VoxVote a try. Remember, it is free for District 214 teachers. Just make sure you register with a 214 email. * I chose not to display the tally because there were some films that did not receive any votes and I didn't want hurt feelings.